Every 90 seconds, a young girl or woman dies from a pregnancy-related complication – but most of these deaths are preventable. With the Reach Every Mother and Child Act, we can end preventable maternal and child deaths and empower women to take control of their own health. This comprehensive, bipartisan legislation includes all the tools needed to prevent the deaths of 800 women every single day. Send a message to Members of Congress today to save lives by making the Reach Act a top priority. I am a supporter of CARE and I am urging you to cosponsor S.1730/H.R.4022 the Reach Every Mother and Child Act of 2017. This bill will ensure that the United States remains a leader in ending preventable maternal and child deaths around the world. With smart planning and access to proven, cost-effective treatments such as vitamins, anti-malaria medication and providing women access to information and services needed to effectively time and space their pregnancies, we can witness the end of preventable maternal and child deaths within a generation. In the 114th Congress, this bipartisan legislation received the support of 219 Representatives and 36 Senators. 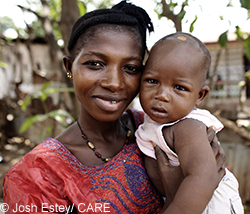 I am writing to ask that you cosponsor this Congress's version of this important bill to preserve America's leadership in ending preventable child and maternal deaths globally. Every 90 seconds a woman or young girl dies from a pregnancy-related complication and in most cases, it's preventable. I'm sure you agree that pregnancy shouldn't be a death sentence for women in developing nations. So let's take a stand together. Please help save the lives of countless women and children by cosponsoring S.1730/H.R.4022 the Reach Every Mother and Child Act of 2017.